Activists took to Queens County Criminal Court in Kew Gardens to present their demands for the next Queens DA. After seven consecutive terms and nearly three decades in office, Queens District Attorney Richard Brown announced in early January he will retire after his term ends at the end of this year. With the 86-year-old’s departure from the District Attorney’s office, progressive grassroots groups have formed the Queens for DA Accountability coalition and are seizing the opportunity to advocate for changes to criminal law in Queens. 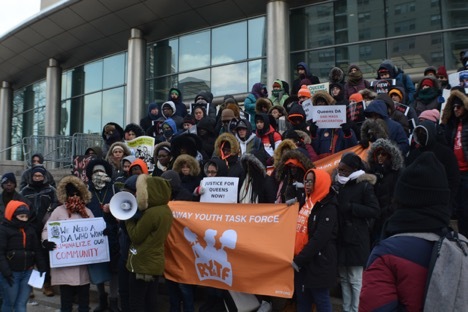 Approximately 100 activists and Queens residents were present on the steps of the Queens County Criminal Court in Kew Gardens on Jan. 21, Martin Luther King Jr. Day, braving freezing temperatures in order to present their demands for the next DA of Queens. The Queens for DA Accountability coalition is concerned with the harmful outcomes that may result from the courtroom decisions made by the District Attorney and hope to make significant changes in the criminal legal system. “As a resident of Queens County, it is my right and duty to speak about the negative impact that the practices of Attorney Brown’s office have had over many years,” Kathy Garcia, who spoke to the crowd outside of the criminal court in Spanish, said. Garcia is a member of a Queens organization called Make the Road that works to end transphobia and homophobia. Garcia was deported to Mexico as a result of charges she faced several years ago. She describes herself and other transgender women as being a target for police. These interactions with the police have put her and other vulnerable residents in danger. “We as transgender women should be able to walk in the streets without being afraid of the police or the injustice of the courts and the prosecution,” she said. The current policies in place at the District Attorney’s office reflect an era of tough-on-crime prosecutors who sought to eradicate the city of all crime. The activists criticized Brown for continuing to take a hard line prosecuting low-level charges, from subjects ranging from fare evasion, petty larceny and marijuana at a time while other boroughs have shifted their focus. Brown has also run largely uncontested for the past 28 years, limiting any outside pressure to evolve his policies. The coalition has released eight demands for the next Queens DA. Some of the demands are a zero tolerance policy for police brutality and other criminal misconduct, a reform of pre-trial practices that contribute to mass incarceration and the protection of immigrant communities. St. John’s public relations major and advocate Kimberly Balderas, a senior, grew up in Jackson Heights, Queens and has seen how Brown’s policies have impacted her community. She can attest to how a policy, such as the one regarding fare evasion, targets low-income Queens residents. “That was a huge one growing up, people would get arrested all the time about hopping the turnstile because they didn’t have their student metrocard or they just didn’t have, at the time I think it was $1.50. As small as $1.50 is, that’s a lot of money for a lot of people,” Balderas said. “Yeah, it’s illegal to jump a turnstile … [But] if you could swipe your metrocard and pay the $2.75, I’m sure you would. They don’t look at the root of the problem. The root of the problem isn’t hopping a turnstile, the root of the problem is…‘I can’t afford $2.75,’” she said. The Queens for DA Accountability wants the District Attorney’s office to give all residents a chance, regardless of citizenship, age, race or sexual orientation. Queens DA policies affect students at St. John’s University, and whoever is going to occupy the position after Brown leaves office is something that every Queens resident, student or not, should keep in their minds. “With a progressive DA, we can hold some cops accountable for what they’ve done. That’s a huge step in the right direction,” she said. “We need to organize and demand for what we want to see in our society,” Balderas said.